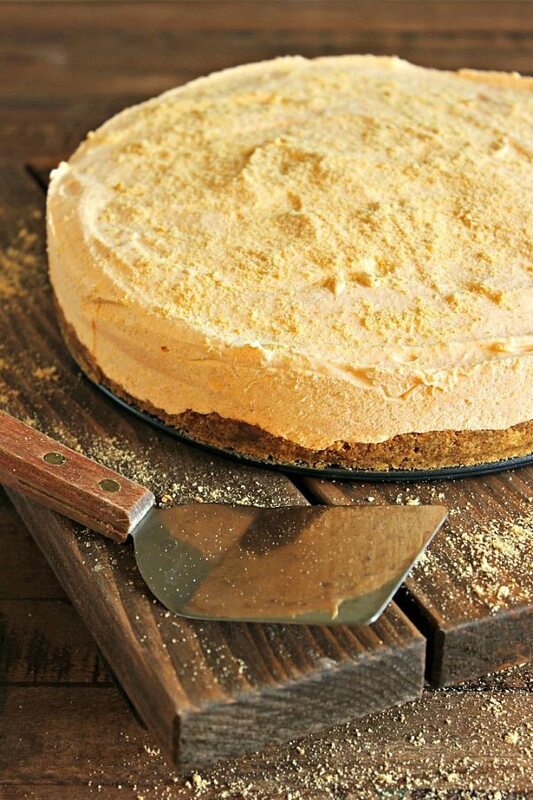 A no bake pumpkin cheesecake – a lighter pumpkin pie on top of a cinnamon crust. All you pumpkin pie haters, listen up. This recipe is just for you! And if you loooove pumpkin pie, even better. Read on! This dessert has just the perfect hint of pumpkin to pass for the most decadent Thanksgiving treat, but without that overwhelmingly gushy pumpkiny (<–apparently this isn’t a word because my spell check just lit it up in bright red) taste. This frozen pie cheesecake can pass for a Thanksgiving pie just as a regular pumpkin pie would. But I think it’s even better AND its a whole lot simpler. With the craziness of preparing an entire feast for Thanksgiving, who doesn’t like a dessert that is (secretly) simple? Lots of great things are adding up to make this such a great dessert. First, there is the cinnamon graham cracker crust. A bit of brown sugar and butter mixed with cinnamon graham cracker crumbs creates a seasonally sweet-flavored crust. This recipe calls for a pretty generous sized crust because I believe the highlight of every pie is the crust. The filling is a bit unique. 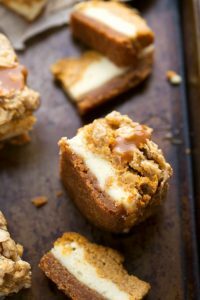 It’s a hybrid of a cheesecake, ice cream, and pumpkin pie. This pie is frozen which gives it an ice cream texture. The cool whip also contributes to the creaminess of that ice cream texture. The cheesecake flavor comes from the cream cheese. Just regular pumpkin with some pumpkin pie spice and the (optional) butter extract mixes to give you the slight hint of pumpkin pie flavor. The filling is beaten together and the cool whip is stirred in. Just two steps and the preparation is finished! There’s no stove-top, no oven, no twenty dirty dishes. Just one bowl, a blender (or food processor) and the mixers for an entire pumpkin pie. This dessert is quite possibly the easiest pie recipe you’ll find for Thanksgiving dessert! And with such a simple dessert (that doesn’t taste simple at all!) you can spend more time with the people that you love. Awww cheese. But isn’t that what Thanksgiving is all about?! A (secretly) simple Thanksgiving dessert. 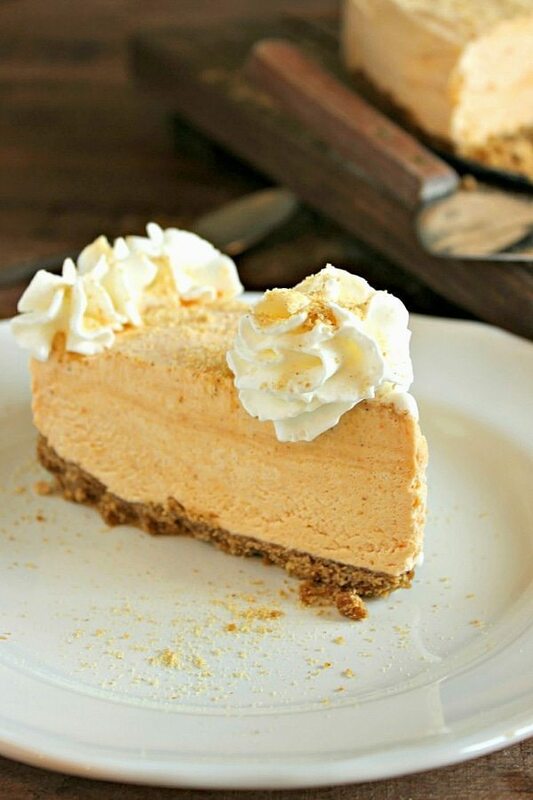 A creamy frozen cheesecake with a hint of pumpkin. 1 cup canned pumpkin not pumpkin pie filling **only one cup-not the entire can. 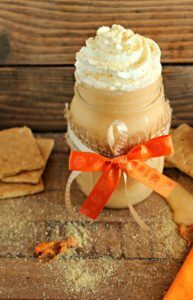 In a blender or food processor, empty the 2 sleeves of graham crackers and process/blend until the crackers are all crumbs. Empty the crumbs into a medium sized bowl and stir in the brown sugar. Soften the margarine or butter and combine with the crumb and brown sugar mixture. In the same bowl you used for the crumbs, place the room temperature cream cheese in the bowl and beat for about 45 seconds or until creamy. Add the pumpkin puree and pumpkin pie spice. Continue to beat until well combined. Slowly add in the sweetened condensed milk and beat until the mixture is completely combined and smooth. Make sure to scrape the edges of your bowl with a spatula. Fold in the cool whip until just combined. Be careful to not overmix the whipped topping. 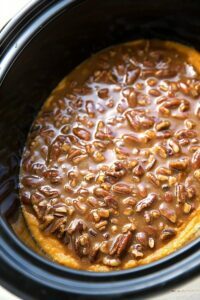 Pour the pumpkin mixture into the prepared crust and freeze overnight or for 6-8 hours or until solid. Let soften for about 5-10 minutes before cutting and serving. Make sure to return the cheesecake to the freezer for storage or it will melt. 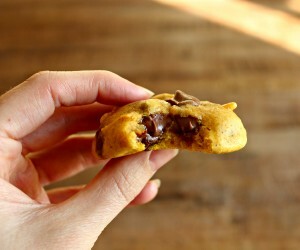 The easiest Thanksgiving treat — three ingredient cornucopia cookies! I’m always too cheap to buy desserts as restaurants too! That and I always have too many that need to be eaten at my home! Thanks for your comment, I emailed you! Wow, I love this. 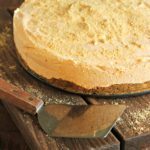 It’s summer in Australia and your frozen pumpkin cheesecake will be perfect for this Yank’s Thanksgiving dinner! Thanks Maureen 🙂 I’m jealous you are enjoying summer! We just had a huge snowstorm last night! Chelsea, this looks fabulous! 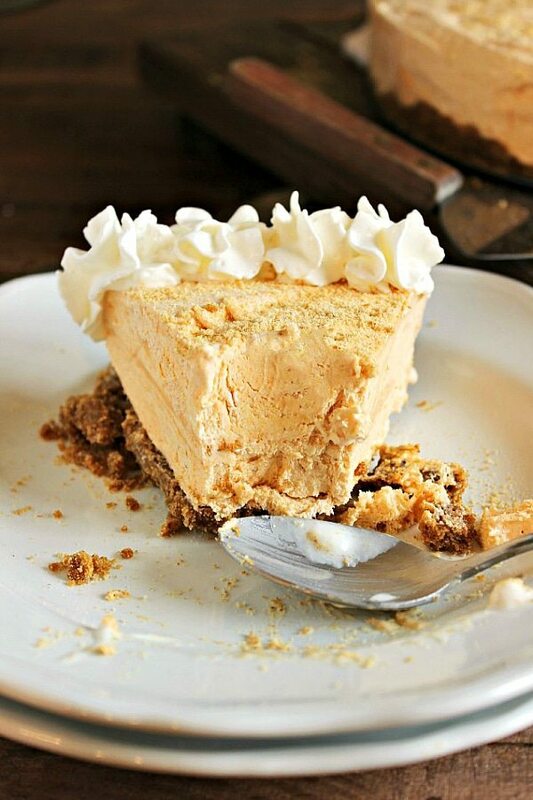 I love any kind of frozen pie but pumpkin frozen pie just makes me giddy with pumpkin-loving joy 🙂 Can’t wait to try this out! This looks amazing! I need to try this for Thanksgiving 🙂 Thanks so much for sharing at Share your Stuff Tuesdays!! how will the recipe change if I omit the cool whip? Hi Marian! You know, I haven’t tried it without the Cool Whip, but I imagine it would be a lot denser. The Cool Whip lightens it up quite a bit. Your pie would also be a lot shorter, or wouldn’t fill up the springform pan as well. If you want, you could try replacing the Cool Whip with about 1 cup of Heavy Whipping Cream (whipping it and maybe adding some sugar before mixing it in with the other ingredients). Let me know what you end up trying and if it works! I don’t have a springform pan, can I use a regular cake pan? Hi Marian! Is your cake pan a 9 x 13 size? The cheesecake will work fine in a cake pan, it just won’t be as tall or “high-rising” as it would be in a springform pan, instead it will just be a thinner cheesecake. The other thing is the cheesecake will be a little harder to serve. With a springform pan, the cheesecake comes out and serves a lot easier since the sides of the springform pan are removed. If you give it a try in the cake pan let me know how it works out! Oh gosh- thank you! I just skimmed the recipe before and misread!!! I just realized that I also misread, and used the whole can of pumpkin puree…it turned out really tasty, but I wonder if it changed the way it came. I just found this recipe. Sounds delicious, but at the beginning with all the pictures it says it uses ice cream. There’s no ice cream in the ingredients list or in the recipe, so did I miss something? Why would it melt if left out if there’s no ice cream in it? Thanks! Overall, I really like this recipe, I used a gingersnap crust, which turned out great because of the pumpkin and ginger marriage. I also crushed some ginger snaps and drizzled on top of it afterwards for a crunch. I definitely recommend this recipe, and will refer to it as the “pumpkin cheesecake ice cream” from now! Thanks so much for letting me know how it turned out! I’m grateful for your comments. I will make the recipe more clear about 1 cup of pumpkin and about keeping it in the freezer! Thank you so much for your feedback. I think it is a bit ice cream texture wise for sure. Also, the gingersnap crust and gingersnaps on top sounds amazing. I am going to try that next time! Chelsea, this sounds like such a crowd pleaser! I love making cheesecake but around the holidays time is short so this quick fix is more my style. Thank you for sharing. I’m visiting from Live Laugh Rowe tonight. Pinned! Thanks so much for stopping by Jelli! I’m so glad you liked it! Thanks Adriana! I love pumpkin pie, now the cheesecake looks divine. Your pictures are absolutely beautiful, thanks for sharing. My family and I love pumpkin pie and I always make a few around the holidays. We also love cheesecake but I usual don’t make cheesecake although one of my daughters will sometime buy the no-bake cheesecake mix and make it. I believe I am going to try this recipe this year in place of one of my pies and see how it goes over. It sounds really yummy. Oh my goodness. This looks SO good! I love pumpkin and cheesecake. What a combo! I adore this recipe, but could I use real whipped cream instead of Cool Whip? My husband and I try to stay away from things like that as much as possible. Plus, I’m a “from scratch” kind of girl. Yes you totally can!! 🙂 thanks Cynthia! Hey there! Recipe sounds amazing! I’m wondering how long it will keep in the freezer? I’d love to make it for Thanksgiving a few days in advance. Thanks! Thank you Vanessa!! It should be fine for up to a week in advance (if not longer!) Just cover it tightly and put it on a shelf in the middle of your freezer and you should be good to go 🙂 Hope you love this!! Do you know what decadent means?… It means decaying, Just saying but awesome recipe sorry I have a thing about that word… Well just for future reference. 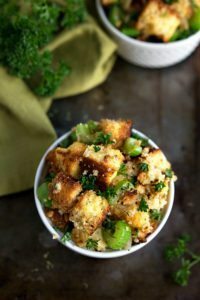 Hi Chelsea, This looks great and I want to make it for Thanksgiving but can you tell me what size spring form pan you used? I have a few in different sizes. Thank you. I typically use a 9-inch springform pan for this recipe, but it’s pretty flexible within the 8-10 inch range 🙂 Hope that helps! Thank you. I did use a 9″ and it looks delicious, can’t wait try it. 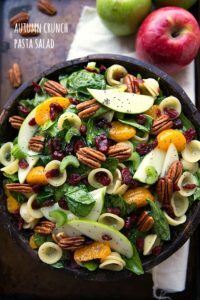 I stumbled upon this recipe last week and all I can say is it is absolutely phenomenal!!! I followed your recipe exactly and loved that it was easy and delicious! Thank you so much! I am hosting a dinner party next weekend and know what I will be serving for dessert. Thanks again, and I am excited to try more of your recipes. I’m so thrilled you loved this pie Shannon!! Thank you so much for your comment and I hope everyone loves this pie at your dinner party 🙂 I hope you love whatever you try next!